SoftPlanet makes it possible for everyone to get free Don't Sleep download directly from our servers. There is no registration needed for downloading. 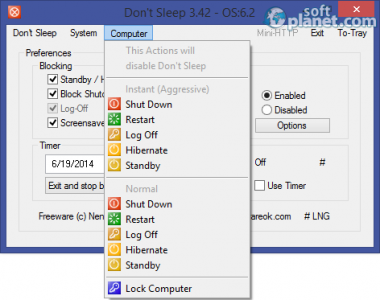 Don't Sleep 3.42 is a small-sized free portable app, which is designed with a single idea in mind – restrict your PC from restarting and shutting down. The program is completely free of charge, so you can have it right away. In addition, it offers you access to most used system tools too like Task Manager, Power Management, Desktop, Monitor, etc. Don't Sleep works in the system tray during most of the time. 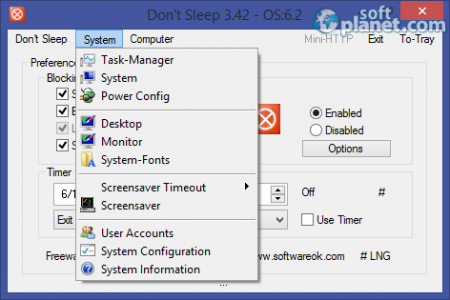 It comes with a very simple interface, which enables you to block Standby, Hybrid Sleep, Hibernation, Shutdown, Screensave and Turn off monitor features of Windows OS. Besides that you are able to set a particular time, when the app will stop blocking them. Despite all aforementioned power action restrictions, actually it turned out that you are able to perform such actions right from Don't Sleep. Funny, right? Don't Sleep 3.42 is a very handy tiny application, which doesn't require any installation at all, because it is 100% portable. Please do not hesitate to download it right away and share your observations. Our security scan shows that Don't Sleep is clean from viruses. The current version of Don't Sleep has been scanned by our system, which contains 46 different anti-virus algorithms. That ensures that Don't Sleep 3.42 is 100% safe for your computer.